The end of summer is almost here Time for one last cannonball into the pool before school starts. No need to pout that summer is over, instead let’s party! 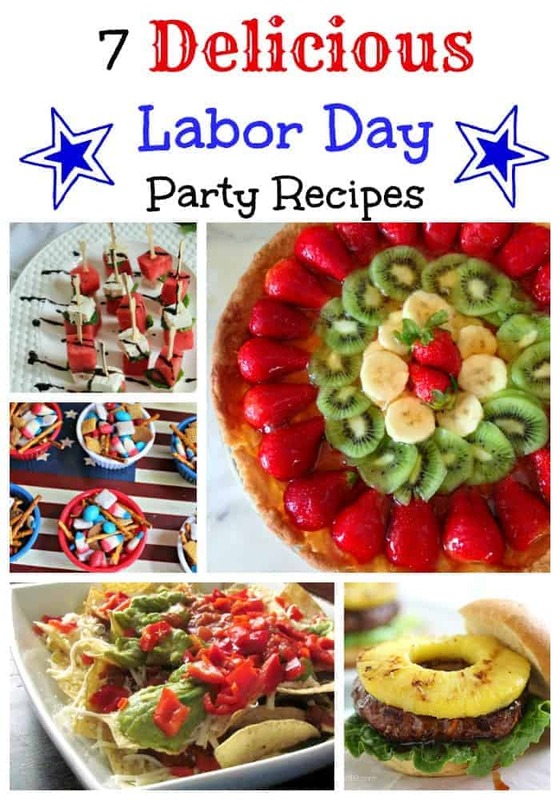 Below I have rounded up some fantastic ideas that you can serve at your Labor Day party, BBQ or pack up for one last visit to the beach. I have been eating watermelon all summer, and this recipe is one of my favorites. Kids and adults alike will love this recipe for Watermelon Feta Mint Skewers from Bites Of Bri. This quick and easy appetizer can be made bite size, or could be thrown in a bowl for a refreshing side. Fresh basil could be substituted for mint and will be equally delicious. I am a nacho fanatic. I think I could eat Mexican food every day. I find Nachos & Guacamole are always a crowd pleaser at a party. Use our quick and easy recipe to whip up a batch for your Labor Day celebration and do not forget to add those last summer tomatoes. If your grill is already hot, throw on a few chicken breasts to dice up over these tasty nachos. What time did you say to come over to your place? One of my absolute favorite summertime treats is grilled pineapple. Change up your burger for this flavorful Grilled Hawaiian Teriyaki Burger complete with delicious pineapple created by Skinnytaste. When picking a ripe pineapple, make sure it smells sweet. If you pick a sour one accidentally, cut the top and bottom off the pineapple and put it in a bag in the fridge overnight to ripen it quickly. I like recipes that look like I worked hard. In reality with a family buzzing around me, I like bringing my recipes to the table quickly. This Asparagus, Tomato and Goat Cheese Quinoa Salad is a perfect cold side to make ahead the night before your party. With the last delicious tomatoes of summer and decadent goat cheese, this salad is sure to be a hit. Fresh green beans are delicious this time of year and can be substituted for asparagus if they look tastier at the grocery store. If you were hoping to have a dish that looks a little splashier at your Labor Day celebration, this Fruit Pie will steal the show. Choose fruit that is patriotic, or just your favorite fruits. Use a readymade glaze, or melt down some jam until it is runny to make the shiny glaze. My favorite is apricot for a tart but sweet finish. Add a pop of color to your Labor Day table. Check out this Patriotic Snack Mix recipe from Teaspoon Of Goodness. Snack mixes like this are simple to throw together. The best part is you can easily change up this recipe to include your favorite flavors. I love the recipe as is, but would probably skip the candy corn and add tart dried cranberries for my family. Eat dessert first! This delicious Yogurt Blueberry Pie dessert is light, airy and perfect for a summer day. Berries are still delicious and inexpensive for a little longer. You can easily substitute whatever berry looks the most delicious in this recipe. Make this one the night before and shove it in the fridge for you party. What are your favorite Labor Day recipes? Tell us in the comments! I really like the nachos, but I have to say that the Quinoa salad looks Soooo appealing to me! I have to try this! The Watermelon skewers look cool. We usually just grill the main food like hot dogs. That quinoa salad is most definitely calling my name. That looks just delicious! It is almost another holiday isn’t it? I forgot. These all look good to me. The Hawaiian Teriyaki Burger looks delicious, I’d love to try this at home. Thanks for the recipes! I completely forgot about Labor Day coming up! I need to start getting prepared! That Fruit Pie looks so good! Hawaiian terrayaki burger looks AMAZING! That’s so good looking. Oh my, these look great! I totally want to try one of the watermelon feta skewers. These look delicious! I’ve always wanted to have a labour day BBQ for friends and family however, I’m never around at that time…or I’m just coming back from vacation! I could use some of these recipes! They all sound great! I like the red, white and blue colors used in the foods! Can’t believe labor day is right around the corner. These all look and sound just great! I haven’t a clue what we are doing! I love incorporating fruit into recipes like this. These look awesome! That fruit pie looks amazing!! Yogurt pie sounds great–blueberries are good but raspberries would be my choice! And that fruit tart –I could really get into eating that all up! That fruit pie looks seriously delicious! I really want to try that one out, but I don’t know if I have the skill for it, lol : )! The watermelon, feta and mint skewers look like a great combo of flavors. I’m going to have to add those to our Labor Day menu. I’m in love with all of the dishes above. Especially that quinoa salad! Everything looks so health and fresh. This would be the perfect Labor Day feast for my family. Thank you for sharing! That hawaiian turkey burger looks amazing! OMG I would love to have that for a Labor Day Picnic! That pineapple burger is calling my name. I think I will have to try this for sure. I have had one in a restaurant but it is always nice to try something different at home. Thanks for sharing! Labor Day!! Oh wow, I hadn’t even thought of it yet, but… it is just around the corner. Thank you for reminding me.